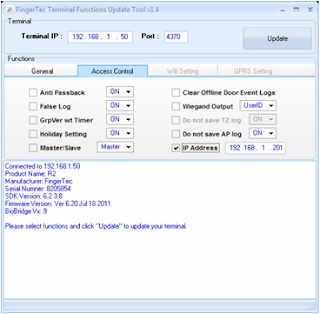 In the latest update, a new function has been added into the FingerTec Terminal Function Tool. The new function applies only to FingerTec models that have the access control feature (R2, Kadex, m-Kadex, Q2i, i-Kiosk 100, i-Kiosk 100 Plus etc). You can use the tool to change the IP address of the terminal. When the terminal is restarted, the changes of the IP address will be applied to the terminal. To do this:Step 1 Insert IP address of the terminal. Step 1 Insert IP address of the terminal. Step 2 Click Connect to connect to the terminal. Step 3 Click on the Access Control tab. Step 4 Check the IP address checkbox. Step 5 Insert a new IP address. Step 7 Click Restart to restart the terminal and apply the changes.